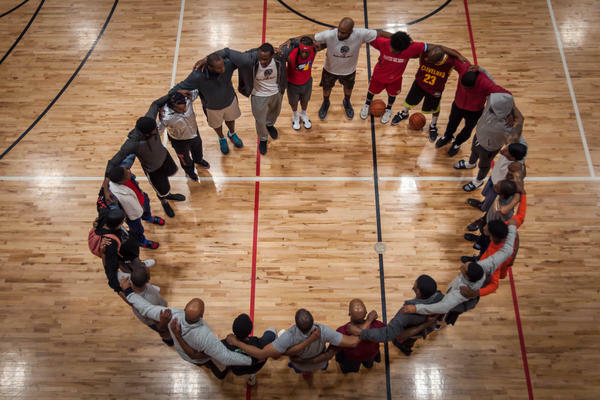 Basketball players huddle for a prayer at the Monsanto Family YMCA. Players pray as part of the weekly God Fam BaLL pickup basketball game at the Monsanto Family YMCA. Marcus Wilson, the executive director for the Monsanto YMCA, speaks during a conversation that flows from basketball to leadership. 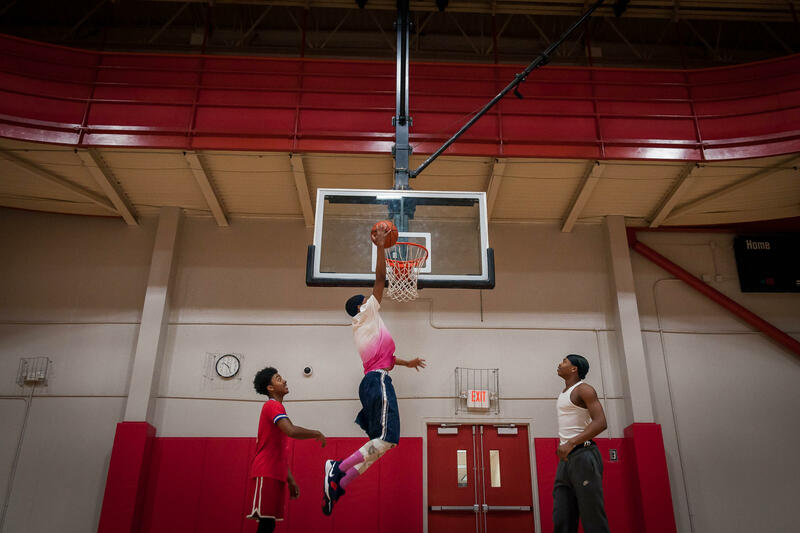 Young men come to the Monsanto Family YMCA in St. Louis every Saturday for a mix of community and pick-up basketball. 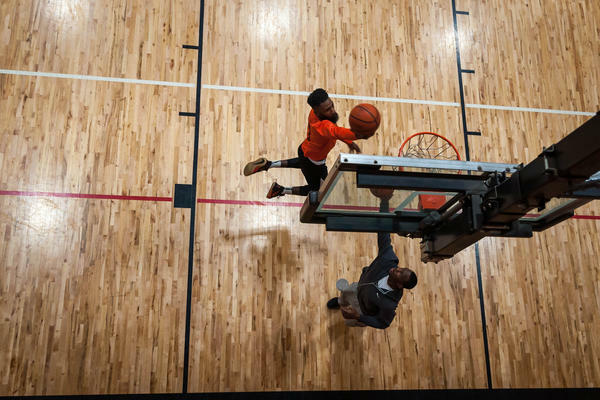 For Marcus Wilson, basketball is more than just a game — and he has the career to prove it. 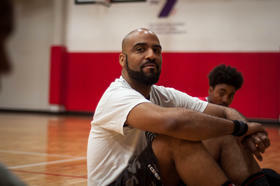 Before becoming the executive director of the Monsanto Family YMCA, Wilson learned that basketball could take him far in life and away from the rough neighborhood he came from. Now he wants to make sure others have that same opportunity. Every Saturday morning, Wilson opens the court of his YMCA off of Page Blvd., free of charge for anyone wanting to play basketball. He only has three rules. “No fighting, no cursing, and if you foul someone hard enough to knock them down, you have to be the one to help them up,” Wilson said. 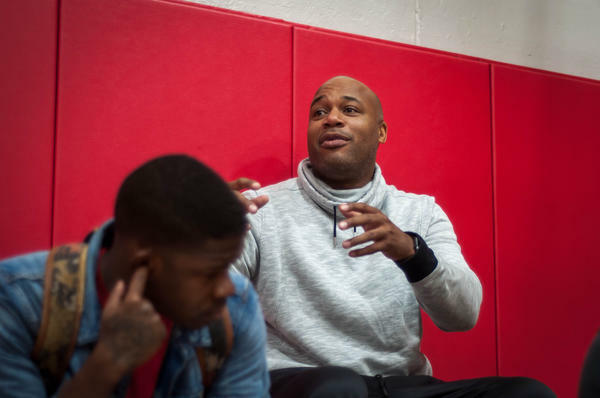 Marcus Wilson, the executive director of the Monsanto Family YMCA, is using basketball to guide others to help them achieve their goals. 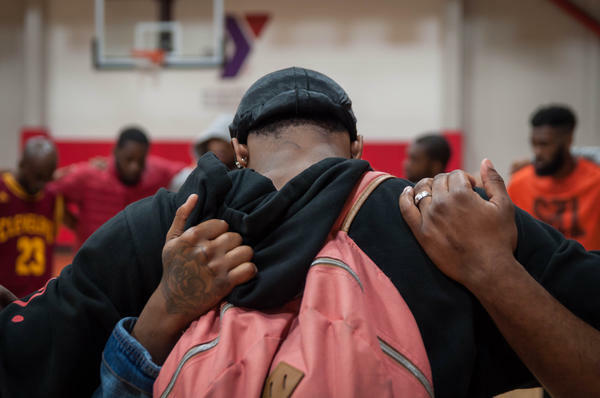 He uses the Saturday morning sessions to provide a safe place for young adults in north St. Louis, an area that has experienced high crime and violence. There, young men come for the basketball, but they stay for the life lessons. Born the youngest of 15 children in South Bend, Indiana, Wilson quickly grew to love basketball. When he was in the seventh grade, Wilson's father told him the family could not afford to send him to college. That’s when he realized basketball would be the key to his future. “My dad had a talk with me in seventh grade and said, 'If you don’t get a scholarship, you can’t go to college — we can’t afford it,'” Wilson said. "So, you need to get either really good at grades, or you need to get really good at a sport." He received a basketball scholarship to the University of Evansville, in Indiana. After graduating in 1999, Wilson took his talents to Europe, where he played for various teams over 12 years. Five years ago, Wilson arrived in St. Louis to continue his basketball career, this time on the other side of the court. He served as a coach for Saint Louis University men’s team until 2016. At the YMCA, Wilson has assembled an all-star mentorship team with Danny Brown and Ishmael Sistrunk. The two assist Wilson in coaching young men to stay away from the crime that many of the men are surrounded by. Sistrunk and Brown created God Fam BaLL, a program similar to Wilson’s, six years ago. Their club uses ministry and basketball to connect with young adults. In late 2017, Wilson started working with the two to extend his mentorship program year-round. “In the black community, we kind of shun that, like, 'Oh, you got to talk to a counselor,'” Sistrunk said. “So for me, this kind of gives us that opportunity to talk to each other, to work through problems, to grow in leadership.” When Brown created the program, he drew on the lessons he learned on his high school basketball team. When his coach asked what the three most important things in his life were, Brown responded, "God, family and basketball." 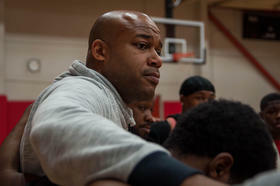 The program has attracted young men dealing with various life struggles. Simien grew up in Los Angeles. He moved to St. Louis in 2010, and credits God Fam BaLL for guiding him away from that lifestyle. Simien calls the program a brotherhood that allows him to open up to others. It’s helped him battle his addictions to alcohol and drugs. He recently celebrated one year of sobriety. The St. Louis sessions have helped others rebound, among them Jahmouri Robinson, a sophomore at Missouri Baptist University. He’s attended the Monsanto YMCA since he was 3 years old. He credits Wilson with recently helping to provide him direction. Robinson would follow a similar path to Wilson’s. He wants to pursue a career playing basketball in Europe, and then use his leadership skills to run a Boys & Girls Club of America. Wilson gets a lot of satisfaction out of seeing the Saturday-morning players improve their lives. Their road to success mirrors his journey, one inspired by his father’s lessons.